After struggling a little with GDM3 and Debian dependencies, I decided to dump that DM and start using LightDM. My only problem was getting LightDM to work with multiple users logged in at the same time, buy I realized this was very easy. Then I needed to make it easy for my whole family, something similar to what XFSWITCH does. So I created a simple bash script for this task. All you need to do is install LightDM and Zenity. Then we're going to create a file, I named it usrchg. 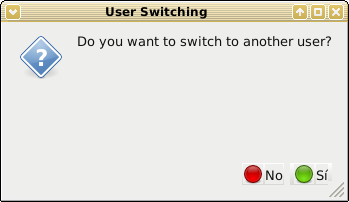 --text="Do you want to switch to another user?" I'm open for suggestions to improve this script. What would be helpful is using this tool to also deal with existing open sessions. For example, if I already have a session open and if I switch from your session, I should go back to my original session as opposed to a new second session. --text="This tool allows you to switch to a different user without closing down your current session. To return to the original user, simply press Ctrl-Alt-F7. Go back again with Ctrl-Alt-F8. Do you want to switch to another user?" The Ctrl-Alt-F7/F8 toggle works like a charm. BTW: we substituted yad for zenity b/c it's already installed and we keep the footprint small--to my eyes it actually looks better. Thanks Jerry. Are you a XFCE dev? Are you going to include this simple code as a plugin? It may be easier for some people to install it as a plugin, like xfswitch is. Nope, just a user with a small amount of knowledge about scripts and a large amount of curiosity. But thanks for even thinking I might be! We are including that in our point release of MX-14.1 that is about to be released, where it is a menu item ("MX Switch User") and also one of the small icons at the top of Whisker menu. Since it is licensed under GPL 3 (http://www.mepiscommunity.org/doc_mx/mx … cense.html) it is available for anyone interested. This is fantastic! You guys are fantastic. If i had a community, I'd want you in it. As many other users, I'd rather that the "switch user" feature of the native XFCE4 Action Button work seamlessly with LightDM, but this is absolutely the next best thing and the best workaround out there. I am posting this from MX-14 Live. I am delighted by the work that the Mepis/AntiX community has done. I have always been interested in a Debian Stable that moves forward just a little faster than Debian Stable. There have been others, but their communities failed me. With folks like you participating in the MX-14 Project, I expect that it will live long and prosper. I sure hope so. I will follow it and help it where I can. Firstly, I intend to seed the torrent as soon as it is created. After that, who knows. I look forward to MX-14.1 and seeing your contribution to it "in print". It must feel very rewarding. I have some older machines that are prime candidates for this distro. Let the test drives begin. Also, as many others, I would be interested in a 64-bit version for my newer machines. If you built it, we will come. If I can figger a way to help with it's development, I will. Linuxers Live by a CODE! Thanks for the good words! We would love to have your help as we move forward from the point release, so take a look at 14.1 and join the Forum! You're Very Welcome. And...elegant, I meant to say the most elegant workaround too. I have implemented this on DebStab, DebTest, and my new testbed MX-14 install. Gonna give it a good lookover before I deploy it to my BOINC cluster (group really). I used the updated script, and in both Debians had to change yad to zenity, as Debian doesn't have yad. Works Great! I hope the XFCE Devs pick up on this and incorporate it into the Switch User section of their Action Buttons. It'd be simpler for all distros. I am duly impressed by other features in MX. I expect to join the forum soon. Look for gmagar. Will look for you! 14.1 is uploading right now, so we should have download and torrent ready in the morning on the website download page. I think yad is not available on Debian's repository. Zenity will work, just not as clean a look IMHO. I wouldn't suggest this for everybody, especially noobies. I commented out all the lines in the script except "dm-tool switch-to-greeter". This keeps the yad or zenity dialogue box from showing up at all and takes me straight to the greeter. This works for me because I have different users set up for different purposes on my box and I am all of them. Why would you make a script if you commented out all the lines except for the one that calls the DM??? Just make a launcher calling dm-tool switch-to-greeter command. Because I'm not as smart as you. I just did what I thought of first. I do what my KnowledgeBase and SkillSet allows me to do at the moment. But your idea is better. In an earlier post, I forgot to give you credit for the original script. I'm sorry. I have since edited that post and corrected this oversight. I don't mind saying again, you guys are fantastic. This is a tool that XFCE has lacked for awhile. Thanks for it. If I'm thinkin' right, a Launcher is just a GUI for, and that creates, a Script. Different paths, same result. But now, thanks to you, I'm a little smarter, knowledgder, and skillder. More weapons in my arsenal is better. More tools in my kit makes work easier. That's one reason I hang in the forums. I haven't done something extraordinary with this simple script, nor with the launcher suggestion, but I'm glad I can help. Humility is good. But you script writers amaze me and enable the rest of us to do what we do. Don't sell yourself short. More folks should gush over you. Appreciation is good. Expressed and Communicated appreciation is better. Just to point out something obvious, you can make Whisker Menu run this script. BTW, a feature similar to what's available on Whiskers Menu would be nice on the classic Applications Menu. I mean, the same concept; a button that let's change to a different user, and the possibility to configure the command that will run when pressed. That's how we have it set up now for the MX-14.2 point release. We put the script in our /usr/ location, then used Whiskermenu to set it up: right-click the icon > Properties > Behavior tab: check Switch Users and navigate to the file. As many other users, I'd rather that the "switch user" feature of the native XFCE4 Action Button work seamlessly with LightDM, but this is absolutely the next best thing and the best workaround out there. As far as I know, to make the "switch user" feature work you just need an equivalent to gdmflexiserver installed. Make sure it's executable, (maybe also logout and back in) and you should be in business. You may use the hacked xfswitch-plugin: the source of the hacked version. It is modified to work in LightDM/Xfce environment.